Ive just bought a new Yaesu ft60e handheld and im looking for advice on upgrading the "supplied" antenna can anyone help with ideas on this please ? First of all congrats, the FT-60 is a great dual band handie, I've had mine a few years and it's taken a good few knocks and drops. Personally I use a Watson Dual Bander which I'm happy with although I read from users on eham that The Diamond SRH77CA is the most popular replacement choice. There are numerous larger (38 to 45 cm long) dual band handheld antennas available. 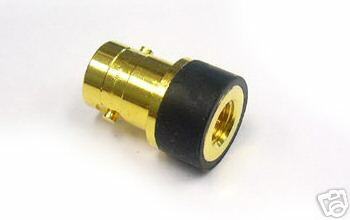 Make sure if it has the SMA type connector that you get the correct type on the antenna & I would suggest you avoid Moonraker antenna products as I know of two people who have brought handheld antennas from them who have had antennas delivered that do not make connection with the radio properly. My experience is that the longer thinner handheld antennas do perform better, but only on weak signals. That is, you will not hear any difference on stronger signals, but where the signal is marginal, it will become clear & noise free. I use both a cheap Nagoya & a more expensive Diamond. The only real difference is price when it comes to day to day useage. Thanks for that Guys but could you give a "model number" of the antennas you are talking about please ? The Watson antenna I mainly use is a WHX-7000, I hear the diamond one may be better but this one performs well for me, much better than the stock antenna which for a very good radio is IMHO a little poor. Also the Watson is only 21 cm (about half the length off the Diamond) which is handy as I take it in the car and up the hills etc. I've also got a handy Watson telescopic antenna which comes in very handy and gives me the wide receive and longer antenna while out when needed but still folds down to a very compact little thing you can take anywhere. Thanks again Guys ive just ordered the WHX7000 and also put the FT60 on for its first charge up now all i need to do is read all about how to prog it and get the CTCSS codes into it , today was going to be spent getting the antenna up for the scanner but sadly my son in law has had to go away on buisiness , im sure i will need help with getting the CTCSS codes into the FT60 but lets see how i get on first. It's pretty simple to operate and easy in the field. To program a frequency in memory just enter it in VFO mode and then press and hold the bottom right button FW to store it in memory, use the dial on the top to choose channel number. How do i find and then input the CTCSS codes for repeaters into my FT60E? Then look at the repeater lists for 70 cm & 2 meters. The page for 2 & 70, will bring up two maps, if you look at the one on the left & find your area (you can zoom in) & then click on your local repeater you will find some basic info, including CTCSS, about that repeater. Below the maps is a alphabetical data base, so if you know the callsign, just look that up. If a WWW is shown, you can click on that & see the repeaters website. Just to add, normally in amateur radio, the CTCSS is only used on the transceivers output this to open the repeater. Doing it this way you will be able to hear any other station on the frequency during lift conditions & yes you can still work long distances with a handheld. I have worked several different countries from Norfolk using handhelds during lifts & I don't mean via my local repeater..Although foreign stations do crop up on there too. Best hand held contact has been a French repeater, talking to a German station.